Indulge in these signature VL tape in hair extensions. Featuring the same natural ratio as your own hair, they are made from the best quality Remy hair we’ve ever felt, they’re a delight to run your fingers through. Adding luxurious length and vibrant volume to enhance your own locks, these premium hair extensions will make you look and feel beautiful. 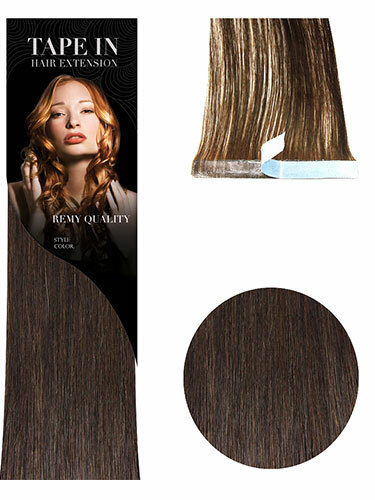 With a good maintenance regime these hair extensions can last up to 24 months! Can’t comment on the hair quality but the guy in the video demonstrating it doesn’t have a clue. From poor sectioning and poor placement and a terrible finish with not enough hair added to give the fuller look he was claiming it was giving. These tape ins in chocolate brown are amazing , they take years off me. look just like my own hair absolutely fabulous quality hair. you really cannot tell i have hair extensions in. wonderful product! Oh my god!....This hair is amazing. it's everything it says it is. Probably the best hair I've ever bought. The I&K Ash blonde Hair is pretty good too. Great shopping experience, well done Hair Trade. Both I&K and the remi tape hair are really good quality hair. I'm really pleased and will defiantly be shopping here again soon.... there should be a 'fantastic' button for me to tick but as there is only a 'good', i will have to tick that instead.